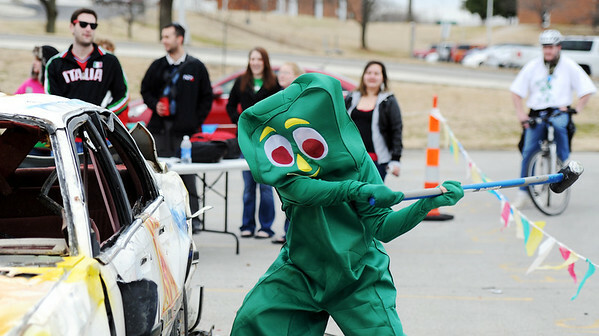 Keaton Burke, a Missouri Southern State University sophomore criminal justice major, wears a Gumby costume as he strikes a car for charity Friday afternoon, Jan. 27, 2012, in MSSU's parking lot. Kappa Alpha Order, Delta Pi Chapter, sold hits on the car with proceeds going to the Muscular Distrophy Association. "I used to use the costume when I worked at a pizza place," Burke said. "Now I wear it because it makes people laugh."